Below is the waiver that every player must agree to in order to participate in any Gotham Activity. 1. I hereby certify that I am in good health and without any physical limitations that would impede my full athletic participation in The Gotham Volleyball League, Inc. I further certify that I am over eighteen (18) years of age and fully competent to execute this waiver and release with full knowledge thereof. 2. I willingly agree to comply with the stated and customary terms and conditions for participation. However, prior to participating, I will inspect both the facilities and the equipment to be used, and if I believe that anything is unsafe, I will immediately inform my team captain, teammates, and referee of such condition(s) and will refuse to participate. 3. Each participant will be engaging in activities that involve risk of serious injury, including but not limited to permanent disability and death, and severe social and economic losses which might result not only from their own actions, inactions or negligence, but the actions, inactions, or negligence of others, the rules of play, or the condition of the premises or of any equipment used. Further, that there may be other risks not known to us or not reasonably foreseeable at this time. 5. I release, waive, discharge, and covenant not to sue The Gotham Volleyball League, Inc., its affiliates, their respective administrators, directors, agents, coaches, referees, security personnel, and other employees of the organization, other participants, volunteers, sponsoring agencies, sponsors, advertisers, and, if applicable, owners and leasers of premises used to conduct the event(s), all of which are hereinafter referred to as “releases,” from any and all liability to the undersigned, his or her heirs and next of kin for any and all claims, demands, losses or damages on account of any and all injury, including death or damage to or loss of property, caused or alleged to be caused in whole or in part by the negligence of the releases or otherwise. 6. I agree and acknolwege that all dues I pay to the Gotham Volleyball League are non-refundable, and Gotham Volleyball League may be forced to cancel matches and/or classes, on notice to me, for circumstances beyond the control of the Gotham Volleyball League. 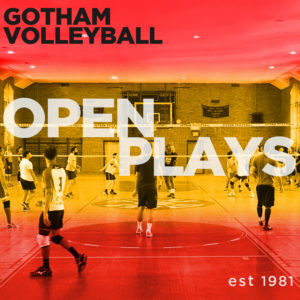 While Gotham Volleyball League will make every attempt to reschedule canceled classes and/or matches, sometimes rescheduling will not be possible, and I will not be entitled to a refund for those canceled sessions if they cannot be held. 7. I agree that the Gotham Volleyball League, Inc. may modify the terms of this waiver and release on notice to me through e-mail and/or the Gotham Volleyball website, and, by continuing to participate in League activities I acknowledge and agree to the modified terms and conditions. 8. I agree that by participating in the activities of the Gotham Volleyball League, I understand, agree to and will abide by its League Bylaws, Rules of League Play and Sportsmanship and Anti-Violence Policy. BY ACKNOWLEDGING THESE TERMS AND CONDITIONS I AGREE THAT I HAVE READ THE ABOVE WAIVER AND RELEASE, UNDERSTAND I HAVE GIVEN UP SUBSTANTIAL RIGHTS BY AGREEING TO IT AND AGREES TO IT FREELY AND VOLUNTARILY WITHOUT ANY INDUCEMENT.